The Google Drive website includes an Activity Stream to help you monitor changes to the various files and folders contained in your Drive. Whether you upload a file, move a file from one folder to another or change the sharing permissions, your actions will get logged. This is especially useful for users who have shared files in their Drive that can be edited by external users. The Activity Stream is however not available inside mobile apps and you’d have to log into the Google Drive website website daily to see what files and folders have changed recently. There’s however a simple workaround. Instead of checking the activity stream manually, you can configure a Google Sheet and it’ll send you a daily email report (screenshot) of all the files in your Drive that have been created or modified in the past 24 hours. And it just takes 30 seconds to set up the monitoring. Click here to make a copy of the Drive Monitor in your Google Drive. Put your email address in the cell E1 highlighted in Yellow. This is where the daily email reports will arrive. From the file menu, choose Spreadsheet settings and choose your default Time zone. The modification time in the report will use this time zone. 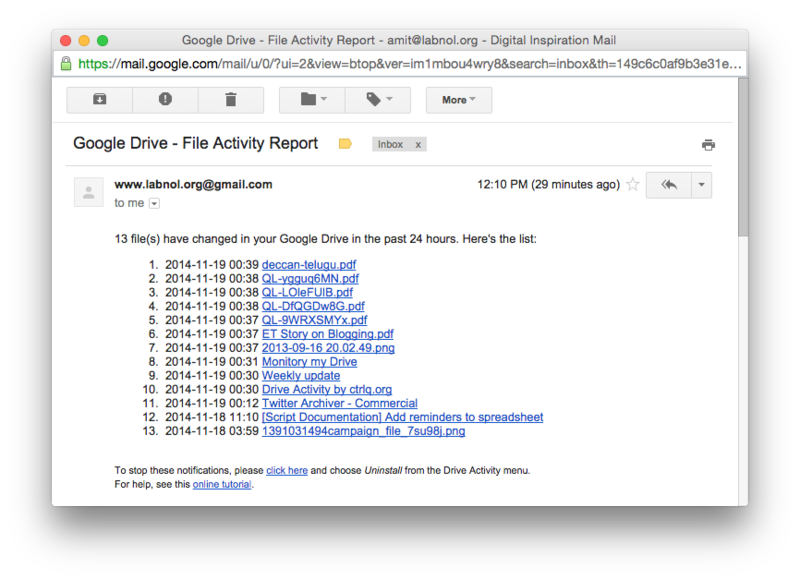 Go to the Google Drive Report menu in the sheet (see screenshot below) and choose Authorize. Allow the script access to your Drive – it needs to do this to know what has changed. Go to the Report menu again and choose Schedule reports. The script is now running in the background and it will email you the Drive report every 24 hours. You’ll get the first report immediately. Related: Who can see my Google Drive files? That’s it. Close the Google Sheet and it will monitor the file changes in the background, running once every 24 hours. If you would like to stop the daily email notifications, open the same sheet and choose Uninstall from the menu. Internally, a little Google Script is doing all the magic!